You are here: Home » Edge News » Make More Good for March: The best way to curb climate change? Girls’ education and family planning. Make More Good for March: The best way to curb climate change? Girls’ education and family planning. The best way to curb climate change? Girls’ education and family planning. In Paul Hawken’s recent book, The Drawdown: The Most Comprehensive Plan Ever Proposed to Reverse Global Warming, scientists and researchers from all over the world came together to model 100 proven carbon reduction interventions. And, believe it or not, the most effective intervention is through girls’ education and family planning. The emissions reductions from investment in family planning and girls’ education could be close to 120 gigatons of carbon dioxide. This outweighs the reduction potential of other interventions such as wind turbines, solar farms, food waste management, electric vehicles and a myriad of other effective solutions. Historically, there has been a focus on addressing the affluence and technology components of this equation, with many straying away from the controversial topic of population and family planning. This is a difficult topic, and certainly one that is hard to summarise in a single blog post, but to put it simply: the higher the global population, the higher the carbon footprint. [It should be noted that the carbon impact per person is not spread equally across the globe due largely to differences in consumption. A single person in the United States would likely have a larger carbon footprint than a single person in Uganda.] After nearly 30 years of climate change assessment, the Intergovernmental Panel on Climate Change (IPCC) has only now in its most recent assessment report included access to reproductive health services, despite previous mounting evidence in support of population growth as a critical factor in greenhouse gas concentrations. There is a strong link between girls’ education and family planning. “Women with more years of education have fewer, healthier children and actively manage their reproductive health. The difference between a woman with no years of schooling and with 12 years of schooling is almost four to five children per woman” (Hawken, 2017). Social, development and environmental issues often go hand-in-hand. Address one and you’ll likely see co-benefits in the others. Through education and family planning, girls achieve higher wages and greater upward mobility, driving improved economic growth. Their health improves, with lower incidence of HIV and malaria. Educated girls have a reduced likelihood of marrying as children or against their will. Girls’ education also improves their capacity to manage shocks from natural disasters and extreme weather events, enabling communities and families to recover more quickly in the face of climate change impacts. To summarize, investment in girls’ education and family planning strengthens economies and creates healthier families and stable communities while also being an effective investment in curbing climate change through a shift to smaller family size. “When family planning focuses on healthcare provision and meeting women’s expressed needs, empowerment, equality, and well-being are the goal; benefits to the planet are side effects” (Hawken, 2017). Social and development benefits for women, that just so happen to also benefit the planet. A recent report from UNESCO estimated that approximately 130 million girls are out of school. “An intrinsic right, education lays a foundation for vibrant lives for girls and women, their families and their communities. It is the most powerful lever available for breaking the cycle of intergenerational poverty, while mitigating emissions by curbing population growth” (Hawken, 2017). Today, around $13 million in international aid goes to education projects and only about one percent of all overseas development assistance goes to family planning programs. Improving these numbers can help curb climate change while also providing immense social and development benefits. This is why I’ve chosen the Malala Fund as the recipient of this month’s ‘Make More Good’ donation from Edge. Donations to the Malala Fund support secondary education projects for girls around the world, aiming to secure 12 years of quality education for all and focusing its efforts in regions where girls are most likely to miss out on secondary education. 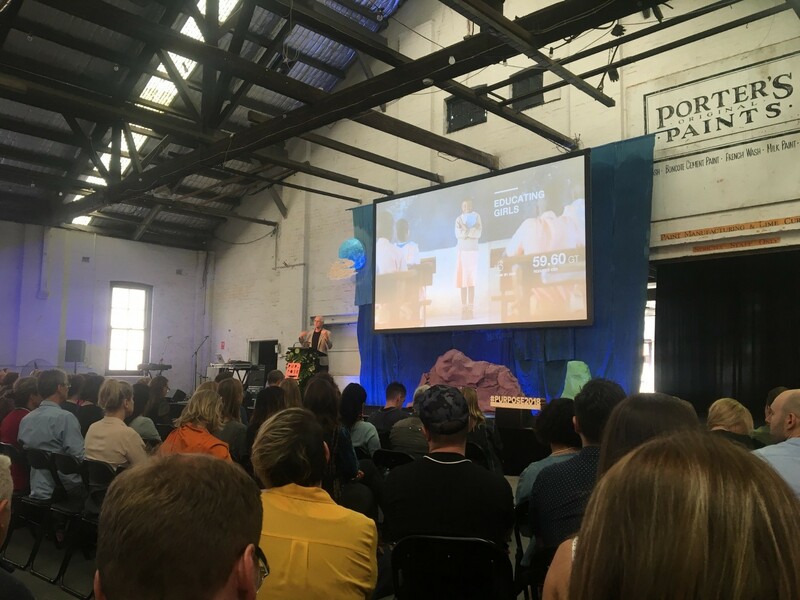 Paul Hawken presenting the findings of Drawdown at Purpose Conference 2018 in Sydney.